In 1942, Sears, Roebuck stopped selling Modern Homes made with pre-cut lumber, but it wasn't long before they were selling houses again. From 1946 to about 1952 Sears sold "ready to erect" Homart Homes in a limited distribution. These houses consisted of factory-built wall panels with windows and doors already installed. Roof gables, front door canopies, roof panels, and basement stairs were also pre-assembled at the factory. The floor and ceiling joists, sub flooring, and other trim parts were delivered as pre-cut lumber. Basements were optional. 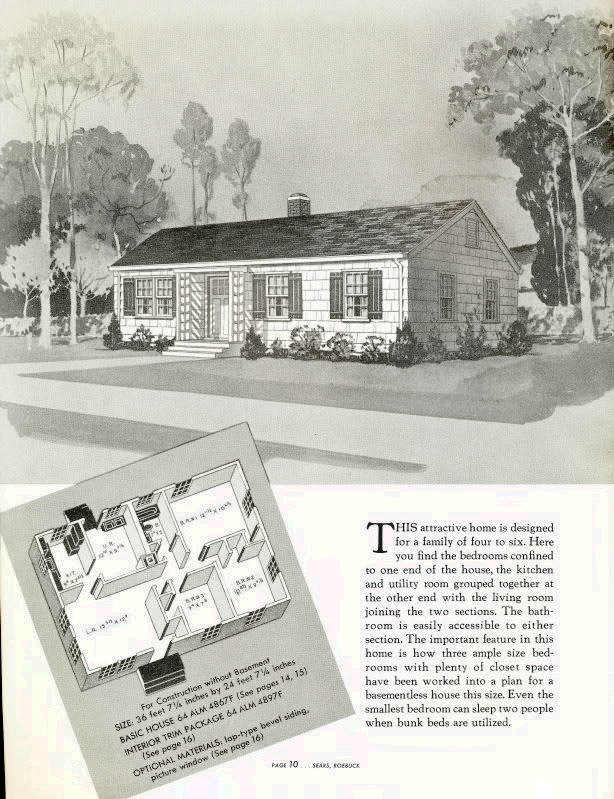 The Sears, Roebuck catalog from Fall 1949 showed how easy it was to assemble a Homart Home. Sears advertisements claimed that three men could get the building "under roof" in three days. Sears sold Homart Homes through mail-order catalogs and through the company's retail stores. For $1.50, Sears would sell you a full-color, die-cut cardboard miniature of your Homart Home, complete with furniture and landscaping. "Plan it inside and out!" said the advertising. Ad from the Garfieldian newspaper, 1946. Homart Homes were sourced by the factory nearest the customer: Cairo, Illinois or Trenton, New Jersey. Usually the materials were delivered by truck directly to the customer's lot. If the customer lived more than 400 miles away from either factory, the materials were shipped by rail. Homart Homes were designed by Richard B. Pollman of Home Planners, Inc.
Prefabricated housing was popular in the years after World War II. Not only was Sears in the business, but so were firms like General Houses, Gunnison, Mobilhome, and Lustron, to name a few. About 11 Homart Homes have been authenticated nationwide. One of those is in Glenview. Many of the Homart Homes had the same exterior dimensions and the same arrangement of the front door and windows. But the interior layouts varied among the models. I could never have spotted this one. There was an article about the house in the Glenview Announcements in 1996. Jerald Stephens and his wife Verda purchased the house in 1951. Jerald was stationed at the Glenview Naval Air Station. He built the family home on an empty cornfield near the base with the help of a few friends. Jerald, who had no building experience, was able to complete the wiring, the plumbing, and the foundation for the basement. Looking for more information about Homart Homes? Check out this blog post on Instant House or check out my article about a Homart Home in Oak Brook Terrace.